The Finger Lakes region is most known for its Rieslings but the wine I wanted to try most after reading Evan Dawson's "Summer in a Glass" (review) was a Pinot Noir. 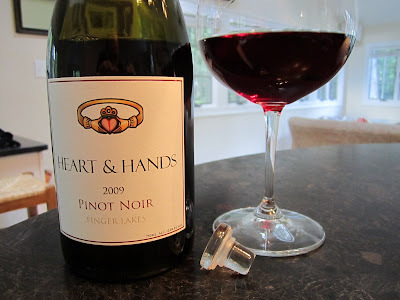 Perhaps it's not surprising given how much I enjoy Pinot but the story behind the wines being produced at Heart & Hands Wine Company left an impression on me. I appreciated Heart & Hands owner and winemaker Tom Higgins' focus on Pinot Noir and how he used his background in geology to seek out land rich with limestone because top Pinot-producing regions have a similar composition. He's intent on making world class Pinot Noir in the Finger Lakes. I was reminded of the book after watching Evan's recent appearance on Gary Vaynerchuk's Daily Grape. They tasted a wine featured in the book - the 2007 Heart & Hands Reserve Pinot Noir. I cracked open a bottle of the 2009. Purchased this after reading "Summer in a Glass" by Evan Dawson. The 2007 Heart & Hands Reserve Pinot Noir was featured, this note is for the 2009 non-reserve bottling. I'm viewing this through the lens of most domestic Pinot Noir I've consumed - Oregon and California. If I were tasting this blind I'd absolutely guess it was from Oregon. Its woodsy, twangy nose seem aligned with aromatics I've found in Oregon Pinots. Beyond that I liked the flavor profile. It seemed to strike a nice balance between sweet and austere. Balanced in that sense. Surprisingly flavorful given its relatively-low 12.6% alcohol level. A really nice value. Nice package too with a reasonably hefty bottle and a unique glass cork I'd not seen before. I dig it.